Even though social media as a marketing practice is constantly changing, those responsible for day-to-day planning and posting may be a little bored - relying on the same tactics to get content out for followers to see. If this sounds familiar, you may want to consider creating a social media advocacy program with the very employees whose work it is you are promoting. Not only will staff members likely be up for the challenge (they just might be in a rut too), but employee-generated content like the examples mentioned below will probably be more effective than those same-old posts anyway. Getting stakeholders on board for such an initiative may come down to knowing a few stats. There's very little chance that a company's employees are not already actively engaged on social media throughout their workday - whether it's an approved activity or not. In fact, a new report from Bambu by Sprout Social reveals 7 in 10 people check social networks while they're at work. Most brands, however, aren't harnessing the advocacy power that this social media user group can offer - and marketing is partly to blame. Bambu data indicates nearly 60 percent of people aren't given ample guidance from their marketing department on how and when to advocate for their brand. 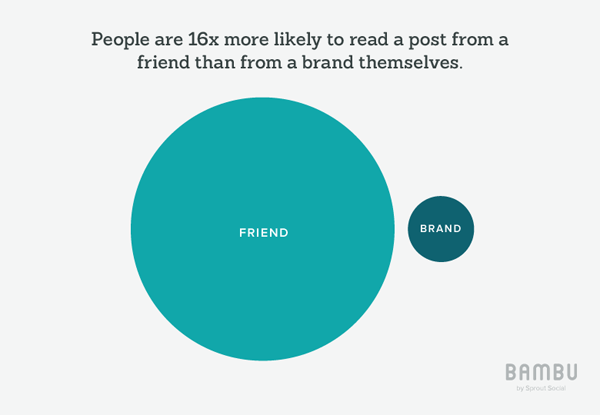 The good news is that even compliance-driven industries (e.g., healthcare, financial firms) can get employees involved as advocates for their brands - and to great effect as 81 percent of people said they would rather see a friend’s social post than a brand’s. The reasons to create an advocacy program are there, but what should the initiative look like? •	Encouraging employees to “sign up” for social media holidays where they take on the social media manager role for “holidays” relating to their company. Some social media holidays to consider include national insurance awareness day, national dessert day, you’re welcome day, clean your refrigerator day (whose work fridge doesn’t need a good clean? ), world smile day, etc. One of the best aspects of a running an employee advocacy program on social media, is just how creative brands can get. Since real business perception and even revenue is at stake, however, brands will want to run the program by human resources to ensure it doesn't violate any brand/staff rules and also set guidelines as to what is appropriate and not. For compliance-driven companies, they will want to make sure to provide examples of what can be posted publicly and what is not acceptable. Companies with legal restrictions should also consider an approval process (although that could negatively impact some of the authenticity that employee-generated content has the potential to provide). While social media managers should resist the urge to micro-manage, a certain degree of social "listening" will need to conducted within their social media management platform in order to recognize brand mentions and respond accordingly whether it's by retweeting, sharing or reposting, applauding the employee for great content or directing the employee in a different direction. As Web professionals, we can certainly get ahead of ourselves - planning creative campaigns that never see the light of day because of the resources involved in execution. If a company gets their staff involved, they need to see the initiative through as it could look badly on the enterprise that gets employees excited for a program only to not end it before it started. Those that think an employee advocacy program sounds like a great way to boost morale within their company while improving social media acquisition and retention efforts, should plan all the necessary steps and weigh all the necessary resources (staff, money) it will take to get it off the ground, follow through and measure its success. With the right foresight, however, brands can really create buzz in-house and out with an advocacy program. Does your company run an employee advocacy program on social media? Let us know about it in the comments section below!